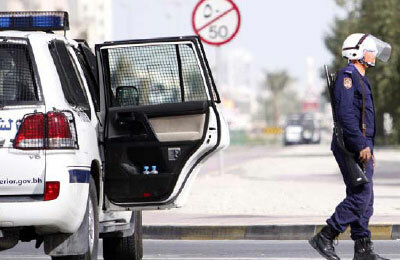 A Bahraini man was sentenced to death on Wednesday for a bomb attack last year that killed a policemen, the state news agency reported. The BNA news agency quoted the Bahraini public prosecutor's office as saying the High Criminal Court also sentenced 11 other suspects, most of them in absentia, in the same case to terms ranging from 10 years to life in jail and ordered them stripped of their citizenship. None of the convicted men were named. Bahrain has been caught up in a region-wide tussle for influence between Sunni Muslim Saudi Arabia and Shi'ite Iran, with authorities here blaming Shi'ite groups for attacks and accusing them of having links to Iran. Tehran denies this. Several policemen were killed in a series of violent incidents last year in the strategically located Gulf country, which hosts the US Fifth Fleet. In one of the attacks last July, a policeman identified as Mahmoud Fareed died after a bomb went off near the village of East Eker, south of the capital Manama. BNA said Wednesday's ruling was subject to an appeal. According to deathpenaltyworldwide.org, Bahrain staged its last execution in 2010. A human rights lawyer said several death sentences had been issued since 2011, but none implemented yet. The king has to authorise any executions.